You are here: Home / Insurance / Why should Life Insurance be your First Investment? Why should Life Insurance be your First Investment? With so many investment options available, one is often tempted to go for returns over Life Insurance. This is a mistake one should avoid and have Life Insurance as your first and foremost Investment option. Investments are important for a sound financial life. However people only think of investments as a process where they put in some money and get more money back on maturity. This is what is the common understanding of investments by and large we all have. Ask anyone what are the best investment options and invariably they start with shares, gold, and real estate. However one has to understand that not all can understand shares in the first attempt, nor will they have enough money to invest in Gold that can give them substantial returns and real estate, well we all know how that works. So for all those first time investors, starting afresh, always take a life insurance first. 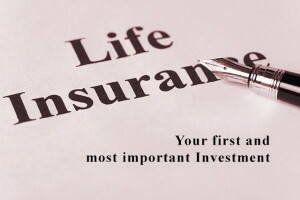 Life Insurance should be your first investment in life. However it is should not be done with monetary returns in mind (here’s why). So now you will think ok, I can go for endowment or money back insurance plans that will give me returns and life cover and also save tax. Again you are wrong. Endowment and money back plans are just OK as investment option, but not good as the first Life cover or First Investment in your life. Your first investment should be Life Insurance and that Life Insurance should be a plain and simple Term Plan and here’s why. When you haven’t invested in anything and are just starting off, chances are that your assets are pretty low or not any at all. Also, what would you have to give your family in your absence? At this time, if something were to happen to you, what is your legacy that you can give your family? How will they cope with the financial void that you may leave for them? Got thinking already? These questions would have already made you understand why you should give priority to Life insurance. Life Insurance will provide you with a sum assured in case anything would happen to you. This sum assured you can choose how much you want based on the premium you can afford. This is one investment that will provide your family with the financial support it will need in your absence and is not dependent on any other assets you have. And this is why the life insurance should be chosen in the form of term plan and not any other fancy plan. Those plans and returns can come later. But first get a term plan and a sufficient cover. Ideally it is said that you should insure yourself for at least 10 times of your annual income. And a majority of people are under-insured because they opt for these fancy insurance plans with the sole purpose of returns in mind and then cannot afford the higher premiums for a higher sum assured, and choose returns over family’s financial security. Forgo the monetary returns when it comes to Life Insurance as this is ‘investment for your loved ones‘ financial security and not monetary gain while you are alive. If you opt for an average endowment policy from LIC at the age of 30 years, for a term of 20 years most likely you will pay a premium of Rs. 5000/- or more per annum and get only a sum assured of Rs. 1 Lac or 1.5 lac with maturity value of around 2,50,000. However if you were to opt for a pure Term Plan from LIC itself, at the same age of 30, you can easily get a sum assured of Rs. 10 Lac for a term of 20 years for a premium amount of around Rs. 2,600 to Rs. 3,000. As you can see that for about 60% lesser premium you get 10 times higher sum assured. This is the main advantage of term plans. It is affordable and helps you to be well insured. Even though it does not have returns, it’s an investment for your family’s security and it should be your priority. So, start your investment cycle with getting a Life Insurance first. And a term plan at that. This will take care of your family’s financial needs to a great extent even if you haven’t had the time to generate significant amount of assets or can’t afford the high premiums of other plans. This however does not mean that you should rest on your laurels, once you get a life Insurance plan for yourself. There are needs that will arise throughout your life time, which will require some amount of extra money and for this you need to diversify your investments into different asset classes. You might as well refer our investment guide for beginners (here) or other investment options like gold (here), mutual funds (here) and child investment (here). Insurance is a backup and a peace of mind for you to know that if anything were to happen to you before you have reached your goals, the people you leave behind and depend on you, will have something to fall back on, because you planned it. This will be your biggest investment for which the returns are invaluable, so please invest in Life Insurance but not for monetary reason though. Great informative post and brief explanation why we should go for simple insurance term. As I know generally people don’t the difference between such condition and plan and also don’t have enough source and knowledge how to know them. And due to lack of they get any plan suggested by others. But this post will help much. Thanks! !